Pond Logic Pond Dye PLUS combines our color enhancing pond dyes with water clarifying Liquid PondClear beneficial bacteria for the ultimate 1-2 punch. 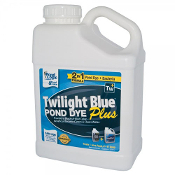 Beautify and protect your pond from troublesome UV sunlight with long-lasting natural shades of Pond Dye while eliminating suspended organic debris that contribute to cloudy water, muck accumulation and weed growth. Our powerful 4x concentrated Pond Dye make sure you’re not sacrificing performance for functionality. One gallon of Pond Dye PLUS still treats like a gallons of other leading pond dyes, even with our clarity enhancing Liquid PondClear beneficial bacteria mixed in! 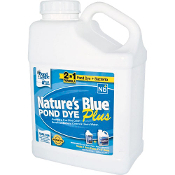 When used in accordance with label directions Pond Logic Pond Dye PLUS is completely safe for your fish, plants, pets and pond wildlife.